Before I begin, let me just clarify that I am no expert in this field. But after almost seven years of being in the blogging community, I have come up with my own list of pros and cons. Now these things may not be true for you but as per my experiences and observations, they are very much holding the truth for me. 1. Blogging is an outlet. I am an introvert, if you haven't read my about page yet. But don't get me wrong, I like hanging out with friends and colleagues, but at the end of the day I love spending time with myself - just reading, surfing the internet, improving my blog, updating my social media, and watching movies and tv shows. I seek comfort in blogging because I feel like I can express myself more through writing than speaking. I can have complex thoughts in my mind and writing them down frees me of them. 2. You discover a lot of people who has the same interests as yours and sometimes, when you're lucky enough, you get to befriend them. I've met lots of unique individual over the internet and while some people tells me they're not real, I say otherwise. These people I met and became friends with are interesting and even if I haven't met them yet, I can sense that they are passionate with the things that they do and sometimes, they seem truer than the people I socialize with in person. The internet can be messy at times but it can also be a place of solace when the real world becomes overwhelming. 3. You get to inspire and be inspired! It's always a great thing when you read something noteworthy from another blogger and be inspired by what he/she has to say. This is one of the many reasons why I love blog hopping. I get to discover more blogs everyday and I get to read a piece of other people's mind. I love reading travel blogs, I get to see the world without getting out of my seat! I love reading lifestyle and beauty blogs because they become helpful when I'd go to the mall and buy something from the department stores and beauty counters. I love reading personal blogs because I'd get a glimpse of somebody else's life and sometimes I can relate to them. I love reading book blogs because I can find new books to buy and read. The blogging community just grows and grows each day and I am happy to be a part of it. I don't know if I have inspired other readers but I hope I did. 4. You can teach and learn. It's amazing today how, from just typing in keywords and hitting enter, you'd get tons of answers from the internet. One problem I've been struggling with these past few weeks was how to improve my blog more and how to get more traffic and learn more about SEO and everything. It's tough work but there are a lot, and I mean A LOT, of blogs out there that are super helpful about these subjects. I've learned so many things from blogs like Blogelina, Beautiful Dawn Designs, Wonderlass, and many more! You can also teach people how to do things. It's a give-and-take but a win-win show. 6. You can develop your photography skills. If you are more of a graphics person, you'd have pictures all over your blog. I for one love documenting big moments of my life and taking photos. It takes time to improve this skill and I'm still getting there. Blog posts looks prettier and more pleasing to the eye if there's at least one photo incorporated in it so I do my best every time I take them. 7. You can tap into your creative juices and develop them! Blogging not only takes a lot of time and effort, it also requires you to be creative on what post you'd do next. Blogging makes me think and visualize and organize. It's comforting to know that you are creating something from nothing, and seeing your ideas come to life just makes it all worth it. It is an exercise for your brain, you'll realize soon enough that you are improving day by day. 8. Blogging can be good for your job applications. I've read about this on the Career Girl Daily blog and it made me think. Yes, it might not be much to me because I work in a mining company which does not really care about writing and grammar and composing stuff; but for those whose careers that are inclined to these things, having a blog is a huge plus. 9. Blogging means you get to see the world in a different perspective. I don't know how to explain this, it just does. One time, I was riding a bus going home and when it started raining, the raindrops on the window gave me an idea on what to blog about. I see my surroundings and I see a lot of potential blog posts from them and this is why I love blogging. It makes me different, it makes me weird like some people say, but it's a good kind of weird for me. 1. The big 'ol blogger's block. This is the biggest problem us bloggers face (chos!). No really, this is. We always have those times when we are too lazy to function. And then, when we're not as lazy, we lack the inspiration to write something; and then when we have the inspiration, we lack the motivation and words to come up with a decent blog post. It's quite the struggle but remember, it will pass. It will always pass. Take all the time you need, be productive in your break, do something else - explore/read/meditate. Eventually, that block will pass off. 2. You are often misunderstood; sometimes by the people around you, sometimes from the people in the cyberspace. The downside of having a blog or being a "blogger" is that you are often misunderstood. You are judged and assumed immediately to have a good life because all you can care about are your social medias, your blog and posting online. Well, news flash, not everyone with a blog is living a good life (some are lucky, though), some of us are experiencing something (a crisis maybe, or a heartbreak or something else) and we don't have the courage to talk to them with our friends or family so we turn towards the internet, more specifically, blogging. Some of us prefer to write than talk, some just really wants to share it online so that other people who can relate to our posts can give us advice or just simply empathize. What you see is not always what you get. If you are only reading blogs just to criticize and discriminate its writer, well, you better get out of here because what you are doing is unhealthy. You don't get to make fun of other people's blood and sweat. You just don't. 3. Blogging cuts you off from the "real" world. This is what they always say when we're facing the monitors of our computers, when our nose is stuck in a book we're trying to finish so that we can make a review about it, when we're busy taking blog-worthy photos during an outing, when we're contemplating and writing in our cute notebooks the thoughts and feelings we have that possibly would be our next post. It's a hard world to please. Blogging takes a lot of your time from the real world but it does not necessarily cuts you off, it's just making you see another world that's full of possibilities. Take for example, you're in an outing with friends and your mind is thinking about what you're gonna blog about it when you get home. It's not cutting you off, it's giving you creative thinking, its making you a story-teller. Having a blog and maintaining it is not an easy job and I admire people who just does a good job of it. 1. The internet is crawling with copycats. An ugly thing about blogging is seeing copycats. Being inspired with a fellow blogger and having ideas to do what she has blogged is okay. For me, it is. It is quite a compliment if somebody was inspired by your posts and they go about writing off their versions of it. But as long as they put their mark on it and put credits then its not a big deal. It would be a big deal if they just copied you and made it their own. That is stealing and if you think that it's okay to steal (especially ideas), you're wrong. People do their best to write posts worth reading, to please their readers, to give them a bit of their thoughts and inspire them and you just don't get to steal what they have worked hard for. YOU JUST DON'T. 2. And then we have the anonymous haters, the infamous internet lurkers and other cyberbullies. These guys are everywhere. Well, I don't have them per se, I just see a lot of them by reading other's blogs. If you have one (or more) of these kinds of people, ignore them. They will be just wasting their time throwing hate at you, and if you will let them bother you, it's your time that will be wasted. DON'T BOTHER. They will eventually be worn out. And that ends my list! 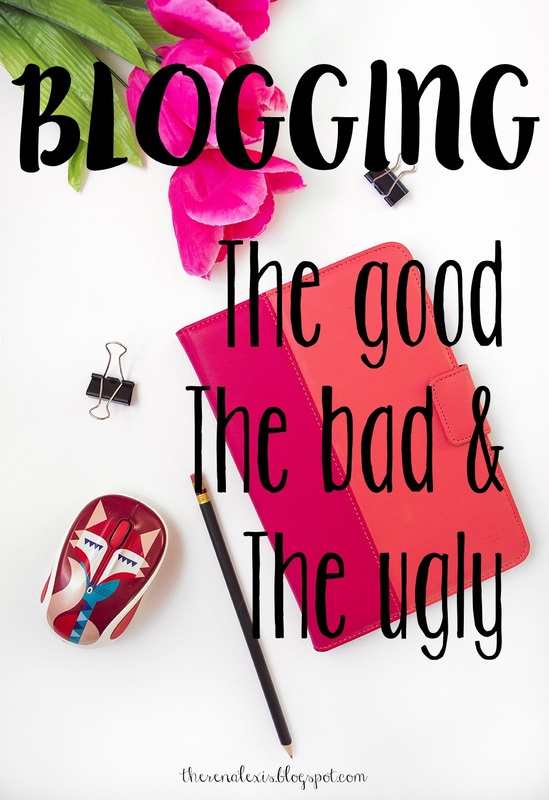 Blogging is just a thing I really love doing and if you guys decide to start yours or if you already have one, I know you've had your share of the good, the bad and the ugly side of blogging. On point! These are all true. Blogging is really a great outlet to inspire others and hone your creativity but it's really hard to stand out. Especially that almost all topics are already covered. Sometimes reading the same articles from different websites, you no longer know which one is the original. Thanks for sharing your thoughts! Thank you Jane :) You have a very lovely blog! Thanks for following back! Great list! Everything you've said is so true. What I love, though, is that you've listed way more of that good than of the bad/ugly in your post, which is very important to remember! Haha, true! Thanks for reading, Bea. I love your blog! your Bad No. 3 is my Ugly No.1 The pressure to make your life all blog-worthy is real! I see your point, it is real!! !